It was a show that may not have ever happened. After the tragedy in Manchester two years ago, Ariana Grande's fans would have understood the decision to stop performing live. 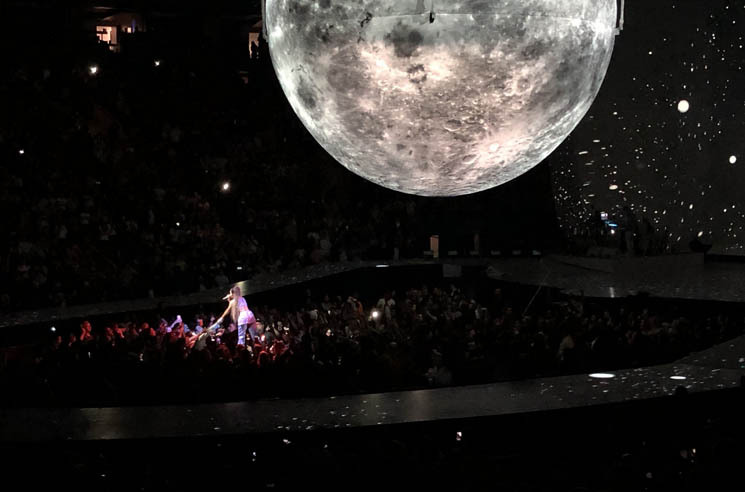 But she bravely embarked on the "Sweetener World Tour" earlier this spring and it showed up in Toronto Wednesday night. From the moment she belted out Sweetener opener "Raindrops (An Angel Cried)" out of view offstage, every lip gloss-coated, cat ear-wearing, high-ponytailed tween in attendance — and there were many — was mesmerized (when they weren't shrieking). But on her last two records, Grande has also captured the older, formerly dismissive demographic — critics, millennials and moms included. It's refreshing to watch a pop star buck the traditional trajectory of becoming larger-than-life and alienating their base; rather, as her career continues to soar, Grande has become more open, honest and appreciative with her growing fan base — be it releasing music whenever she feels like it or immersing herself amongst the Ariantors on social media. Her stage show certainly was larger-than-life — there were giant moons, graffiti-covered pink cars, and, like, the whole universe on a video screen — but it was the moments of humanity that were most memorable, like the childhood video recordings projected on giant screens between acts and her forays into crowd to hold hands and tell fans that "I love you too." She powered through a set that relied heavily on Sweetener and thank u, next, with "7 rings" and "NASA" receiving the most elaborate treatments (the pink car for the former and an impressive simulation of outer space for the latter), while her spectacular vocal abilities especially stood out on "breathin," "needy" and "everytime" — at least until "Dangerous Woman" was embellished with Grande's biggest belts of the night. Older tracks like "One Last Time," "Into You" and "Break Free" also received enthusiastic receptions, as did guest-less collabs like "Side to Side" and "Right There," which were given new life with fun choreography, visuals onscreen and multi-coloured pleather outfits. But it was before she delivered set closer "No Tears Left to Cry" that Grande got candid and emotional. Thanking fans for attending, she told them they "make everything so much better" and expressed her gratitude for the energy in the massive room. Her voice cracked and she stopped herself from rambling on by launching right into the euphoric (if unfortunately the title doesn't necessarily always ring true) lead Sweetener single with a simple, "I'll shut up, this is 'no tears left to cry.'" The emotional, uplifting finale was only bested by the encore of "thank u, next." Introduced with a montage of headlines and Grande's own tweets, the song received rapturous applause as she and four dancers sashayed around the circular stage for a victory lap, leaving onlookers with an image of an artist at her creative peak, having fun with a talented and genuinely supportive crew of collaborators.